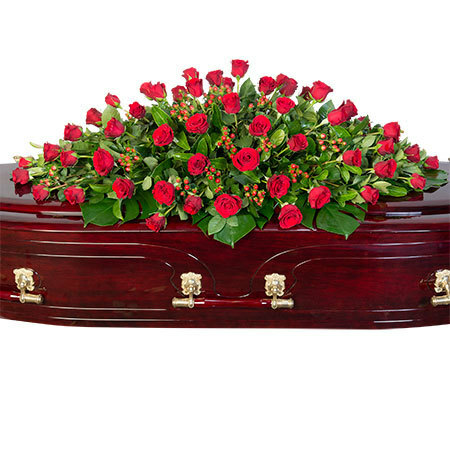 A rich red traditional funeral flower arrangement for a casket, featuring long stem red roses, fresh greenery and hypericum berries (or similar). 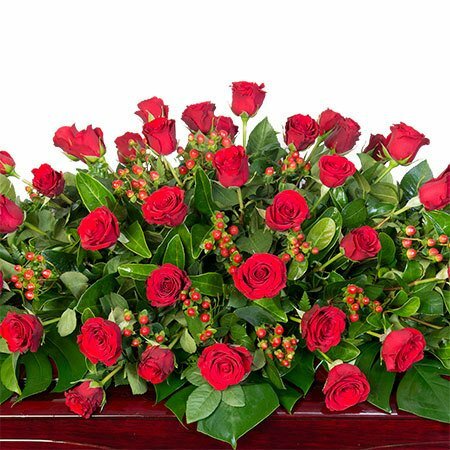 To arrange this red rose funeral spray, simply place your order via our online florist shop or give our friendly consultants a call on 1800 66 66 46 or email sales@flowersforeveryone.com.au As Sydney`s professional funeral flower service providers, we provide premium quality funeral casket flowers and excellent service. If you need to arrange funeral flowers outside Sydney, our florists will coordinate your casket flowers via an affiliate florist to recreate our design and colours as closely as possible.